One reason why Hillary Clinton is dropping in the polls and Bernie Sanders is climbing is that voters prefer a more open and honest candidate such as Sanders. Hillary Clinton has practiced triangulation to avoid taking a stand on controversial issues throughout her career, and we saw it again this week on the Keystone XL Pipeline and Planned Parenthood. When you are running for president — whether or not you served in the current administration — you are going to be asked to take positions on issues that the current president is dealing with. As long as we hold elections that begin two years (or more) before the current president is set to leave office, that’s going to be a thing candidates need to contend with. If Clinton’s position is that she can’t take a public stance on any issue that has some sort of pending business before this White House, then she’s not going to be able to take a position on, well, anything. And she’s already shown that on some issues, she is willing to take a position. Clinton came out in favor of the Iran deal, for example, despite the fact that its fate remains up in the air in Congress. Second, the whole point of a campaign is for voters to get to know the candidates and understand what their respective presidencies might look like. People and reporters and the candidates you are running against ask you questions. You answer them — most of the time. It’s what we do. It’s how voters can feel as though they are making an informed decision come Election Day. Imagine if Jeb Bush, when asked about the immigration problem in the country, said only: “Look, it’s a complex issue. I am not going to say anything about it until I am in the White House.” There would be massive outrage — and rightly so. Bush would be accused of obfuscating for purely political reasons. Which, of course, would be what he was doing. 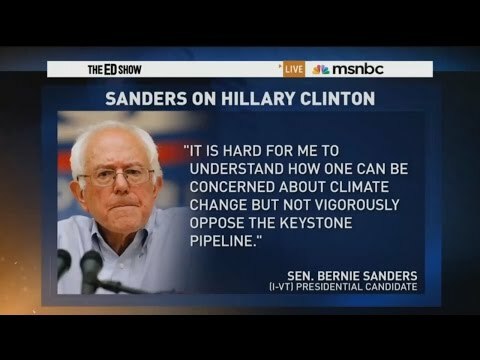 Beyond the question of the Keystone XL Pipeline, Clinton has received criticism from environmentalists for her support for off-shore drilling and fracking. It is also doubtful that she would take effective action on climate change considering the amount of money she receives from the petroleum industry. Hillary Clinton has staunchly defended Planned Parenthood in the wake of recently released videos that an anti-abortion group claims to show employees with the organization discussing the sale of aborted fetal tissue. But, in a new interview, she calls the graphic videos “disturbing” and says there should be a national investigation into that practice. She did also defend Planned Parenthood in general, but undermined them in fighting off the right wing attacks with statements such as this. As I discussed previously, right wing organizations with a history of distorting the facts are used the tapes to present a false claim that Planned Parenthood is selling fetal tissue. In reality, the tapes show that they were negotiating over fees for collection, preservation, and transport of fetal tissue which was donated for biomedical research. This is both legal and conventional. It is no different than when I do a pap smear and Medicare or private insurance companies pay me for collecting and arranging transport of the specimen to a lab. This does not mean that I am “selling” cervical cells and Planned Parenthood is not “selling” fetal tissue. With Republicans using this false attack to threaten to cut off funding for Planned Parenthood, Clinton should be defending them on this point, not calling it “disturbing” and calling for a national investigation into a practice which is fully legal. Clinton continued to undermine abortion rights in saying, “I have said for more than 22 years that abortion should be legal, safe and rare.” Reproductive rights advocates such as Katha Pollitt in her book Pro: Reclaiming Abortion Rights, have criticized this statement for reducing the status of abortion rights and stigmatizing women who do have abortions. Jessica Valenti has written, “Agreeing with anti-choice activists on even that single word hurts women and the cause of reproductive rights.” Clinton has also upset defenders of womens’ rights in the past with her support for parental notification laws. This is just a small part of Clinton’s tendency to compromise liberal principles, often siding with the religious right on social/cultural issues. Even Democrats who are not Sanders partisans are concerned about Clinton’s sometimes-opaque comments on the campaign trail. “What people are looking for is to know what’s in her heart,” said strategist Jamal Simmons. Further fueling concern are a number of recent polls that have shown Clinton performing very poorly when voters are asked about her honesty and trustworthiness. Last week, a Quinnipiac poll showed Coloradans asserting by an almost 2-1 margin that Clinton was not honest or trustworthy: 62 percent said she was not, whereas only 34 percent she was. Respondents in Iowa distrusted Clinton 59 percent to 33 percent, and those in Virginia distrusted her 55 percent to 39 percent. Keystone is far from the only issue on which Clinton has bobbed and weaved. On the minimum wage, a key issue for many liberals, she has backed a minimum of $15 an hour for fast food workers in New York but has not stipulated a nationally mandated figure. She avoided taking an unequivocal position on the Trans-Pacific Partnership (TPP) even as the related debate over fast-track trade authority roiled Congress last month — and her position remains unclear. Additional examples of Clinton’s habit of trying to avoid taking positions on the issues were also noted in the article. Posted in Bernie Sanders, Environment, Hillary Clinton, Social Issues. Tags: Abortion, Climate Change, Environment, Hillary Clinton, Planned Parenthood, Social Issues. RSS feed for comments on this post.. TrackBack URL. "Reproductive rights"? You mean "Killing babies rights" don't you? And before you tell me that babies are never killed let me ask you a medical-scientific question: When, exactly and precisely, does a foetus become a baby? I mean the rights of the woman to control her own body which you so willingly violate. No babies are killed. By definition, a fetus is the stage of development from eight weeks after fertilization until birth. You're dodging the question, Ron. When does a zygote change from being a non-human and become a human, or to use a four letter word you seem keen to avoid, a baby? I was not dodging any question–I answered the question you asked based upon the scientific definition as you asked. Your question now is irrational. A zygote which becomes a human is never a “non-human.” A dog zygote will never become a human. You look like you once again are trying to distort the science of embryology as conservatives typically do regarding abortion, to try to turn what occurs over a continuum into some sort of non-existent discrete event. I ask again, at what point in the the "continuum" does the zygote/foetus become human? David, I don't think an exact answer is possible. Late in the pregnancy what we have is clearly an unborn child that I agree should be protected. But very early all we have is a bunch of cells. Ron, quibbling aside, PP is selling tissue from aborted fetuses. A quibbling defense will impress no one, and right now is impressing no one. Want to defend PP? Then defend the sale of fetal tissues for research purposes. As for the PP management, they are as out to lunch on the moral perceptions of the American people as defenders of Joseph Mengele. Oh, I favor the pipeline, by the way. Immediate strangulation of the economy is not my idea of a desirable move, global warming be damned. Trying to claim some magical point which does not exist is one of the many ways in which conservatives distort science. No, Planned Parenthood is not selling anything. This is not quibbling at all. Legally there is a distinct difference between receiving payment for collection, preservation, and transport of biological specimen. This is in no way “selling” and those who are calling it selling are distorting the facts to attack Planned Parenthood. Opposing the pipeline in no way strangulates the economy. In this case I am more concerned about Clinton’s refusal to answer at all as opposed to her having a stand either way. Hillary is a known entity. It seems clear to me she is only about getting power and self aggrandizement. Perhaps a number of the other candidates are as well, but I'd pick any of them before I'd pick Hillary. There is nothing I've heard or read about Sanders or O'Malley that wouldn't make me think that it was their greatest desire to make the country better. Sadly, I don't believe that is Hillary's greatest desire. I think she would take any position on any issue if she thought it would get her into the presidency. Mike, that sums up Hillary Clinton. I've seen conservative commenters on your blog say they would rather Hillary lose in the primary because other Democrats would be easier to beat in a general election. While I personally would like the very long shot Ben Carson be the Republican nominee, I'm not supporting him because of his odds of winning, I'm supporting him because he seems to me the best person among the Republican candidates. I'd rather vote for a good person that ended up losing then a lousy person that had a better chance at winning. I think that Clinton would both be a poor choice for president and would make a weaker general election candidate than most other Democrats. So if it's human – and I agree with you entirely – then killing it, except in extreme circumstances, is a moral crime and should be a legal crime. Killing 53 million of them since 1973 is a crime against humanity far in excess of anything Hitler ever managed. David, this makes no sense. Just being human tissue does not make it a immoral or a crime to kill it. By your logic, masturbation would be mass murder. By your logic, removing a malignant tumor would be murder as it is made up of human cells. Aborting a fetus is neither morally nor legally a crime. That, Ron, is sophistry of the highest (or lowest?) order. A sperm is just that – a sperm. In and of itself it has no value. When it attaches itself to a female cell then suddenly a process begins. From that precise moment a human life is created. It's where you and I began. To destroy that creation is to destroy a human life. A sperm is an important part of the process and is a form of human life. Granted we are talking a major difference after implantation, but we still just have cells with no consciousness. To compare a mass of cells post conception to a fully developed human life makes no sense biologically. Your argument also fails ethically as it fails to take into account the right of the mother to control her own body. So I repeat my original question which you seem determined to avoid: exactly when in the process does it become "a fully developed human life" and what are the criteria for deciding? As I have told you several times there is no such point. Human development is a continuum. Attempts by conservatives to define such a nonexistent point are a tactic to distort science. OK, so why not wait until it is born and then kill it? Because unlike conservatives, the rest of us have a rational system of ethics. Give it up, David. You haven't got a prayer. Rational? Like, you can kill it up to 'x' weeks, or if necessary up to 'y' weeks and in exceptional(?) circs you can crush the little critter at 'z' weeks, er, so long as you can get the bits out in one piece because, well, they help pay the overheads! David, with this rambling nonsense you are just showing that you have no comprehension of the issue. Of course that has been obvious by your reliance on junk science to make your arguments.